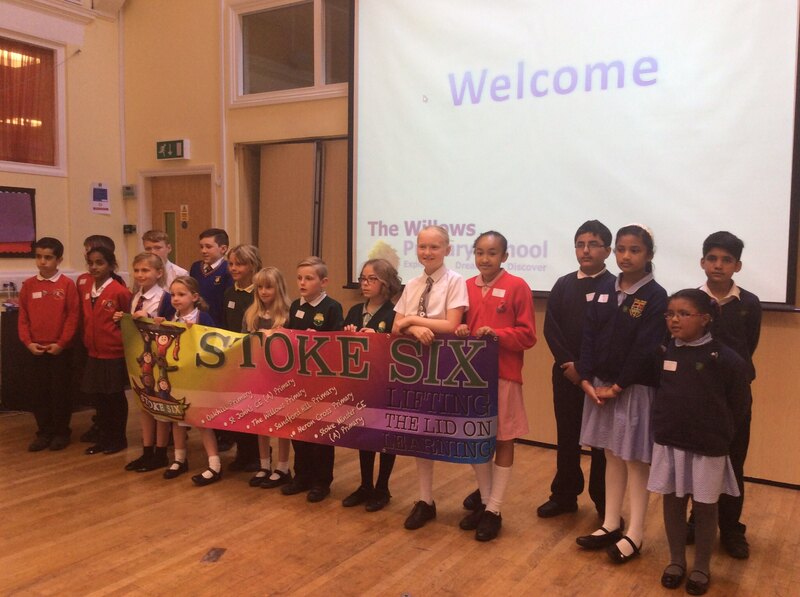 On Friday 27th May the school councils from the Stoke Six collaborative group met at the Willows Primary. Each school council gave a presentation to explain the events they run and the roles they have within their schools. There are a large number of responsibilities they each hold. Our school was represented by Deanna (Chair of the School Council) and Andraya (Treasurer of the School Council). I felt very proud as the girls spoke confidently and passionately about the wide range of work that they have undertaken since being elected by their peers. This has included: raising funds for charities, having an input into school lunches, carrying out and analysing questionnaires on a variety of subjects including bullying, supporting the local community in projects such as Clean for the Queen and taking responsibility for charting attendance and behaviour. It was very clear that the children from all the schools take their roles very seriously and that they feel their position is valued in their schools. As a result of the presentations it was decided that a follow up meeting to allow the children to explore ideas for a future project based on what they had heard would be a good idea. It was also decided that the school councils would meet on June 10th at St John’s Primary 1:30-2:30. All the head teachers agreed that Deanna should chair the meeting. This entry was posted in Head Teacher, Year 6 and tagged Anti Bullying, British Values, P.H.S.E. on June 3, 2016 by Sandford Hill. I had a fab time at Willows Primary! I enjoyed listening and finding out what other schools do-it was very interesting. How nice to hear about our schools linking together with the School Councils and sharing ideas and experiences. Thank you to the two girls that attended to represent Sandford Hill and I am sure that your next meeting will be successful and that you will bring things back with you that help to enhance the great things that already happen at our school.